Creating a luxury kitchen that has both form and function doesn’t need to be expensive. With proper planning and execution anyone can create a luxury kitchen that the whole family can enjoy. The kitchen design team at Mayfair Granite have put together their top tips for designing the perfect kitchen. Form and function are the most important considerations to take into account when it comes to designing a kitchen, so thinking about how the space is used on a daily basis is key to designing the best layout for you and your family. L-shaped kitchens are a popular choice for kitchen layouts because of the adaptability and options available. Adding an island bench creates a focal point for the room as well as adding a great space for entertaining. An island can also be utilised to create extra storage for smaller kitchens. The L-shaped kitchen layout is a great option for open plan kitchens and also maximises the floor space, perfect for families and couple to cook together without being too cramped. For smaller kitchens, try a U-shaped kitchen design to maximise the worktop and cabinet space. Integrated appliances are also a popular option for smaller spaces, but standalone appliances can be used to create a focal point and add colour to the design. Technological advances over the past few years means that there is now a vast array of interesting and exotic materials to choose from when planning a kitchen. 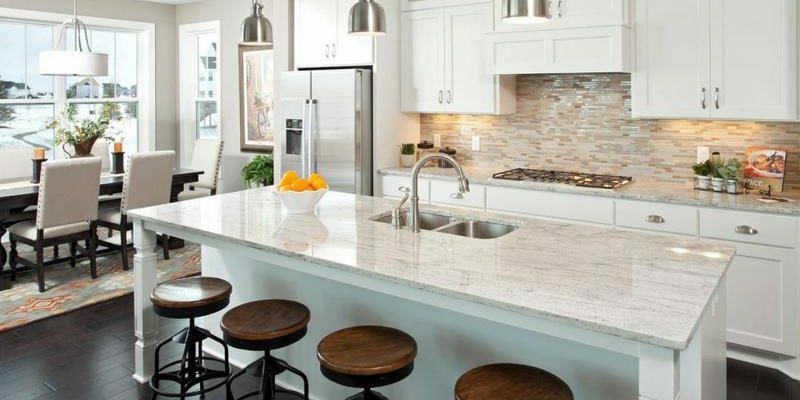 Natural stone worktops such as granite and solid wood cabinets are still seen by many as the peak of luxury, but there are a range of metallic materials becoming popular including brass, copper and zinc that really create a wow factor. Cabinets are the biggest investment for any kitchen design, so choosing a hard wearing material is key to making the kitchen stand the test of time. High quality woods are the best choice here for strength and durability; they not only look good naturally, but can be painted a wide array of different colours to match any theme. The choice of kitchen appliances is also a big consideration when creating a luxury space. Choose items that match the style you are going for and make sure that these appliances do everything you need or you may have to replace them further down the line. Once you’ve decided on the appliances you want, shop around for the best deals to save yourself some money. A good mix of task lighting and natural light is important to make the kitchen functional, but the use of ambient light can also be used to create a space to relax and entertain in. Gone are the days of unsightly strip lights and spot lights. A popular choice nowadays is pendant lights which create a luxury look without breaking the bank. Under cabinet lighting is also a good idea for food preparation in low light situations, and for something a bit different, why not install LED light strips to create a dynamic lighting effect. Creating the perfect kitchen is all about planning, but if done right you’ll have a functional and luxury space that will stand the test of time and add thousands to the value of your home. Kitchen is one of my favorite part of the house, it is where I usually stay and my kids.. I am planning to renovate it and make it more spacious and I want to have an island bench where we can have our breakfast and snacks. Enjoyed reading Simon. Thanks for this post.